The Blue Line at the newly renovated Government Center T station. Why don’t we aim this high all the time? The new Government Center T station is a thing of beauty, the kind of public space that honors us, rather than merely accommodates us. Spare and airy, the gorgeous glass box soars above City Hall Plaza, a bold, modern focal point for that blank, brick tundra. Step inside the station, and you feel like you’re part of something grand. Look up, and see the old city from inside the new. If only we brought this level of ambition to every transportation project. Instead, even as Governor Charlie Baker rightly celebrates the new station with all the excitement of a kid getting his first train set, his administration seems determined to make sure the Green Line extension doesn’t approach Government Center’s greatness. The ballooning budget that has called into question that long-awaited, legally-mandated, project is not of Baker’s making. And nobody blames the administration for putting the brakes on the thing while engineers and designers attempt to get costs under control for the new line, which would run from Lechmere station through Somerville to Medford. But the stripped-down proposals offered so far, while they save dollars now, squander the Green Line’s great potential for public good. 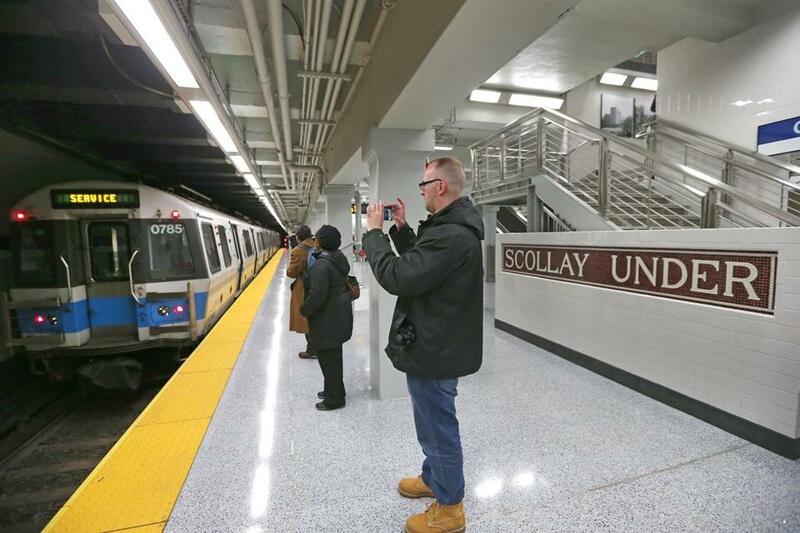 Consultants have suggested shortening the platforms at some of the seven new stations, and, at five of them, doing away with enclosed head-houses — buildings where commuters gather to buy tickets and coffee. Some of those buildings would have been lovely additions to the streetscape, creating public spaces that would draw other development — and beckon those who might otherwise give the T a miss. The Department of Transportation has suggested replacing proposed elevators and escalators with ramps, and providing one access point at some stops, instead of two. They’ve suggested taking away the covers on some platforms, leaving commuters exposed to the elements, or relegating them to small shelters. At Union Square, they’ve raised the prospect of replacing the proposed light rail line with a bus, or a pollution-boosting stop on the commuter line. And they appear set to scale back a community path that would allow bikers and others to go all the way from Concord through Lechmere and back out to Newton along the Esplanade. The Green Line will probably not end up as spartan as all that, but make no mistake: Compared with the original vision, it’s going to be a bare-bones affair — more BU West than Ashmont (the new Red Line station that transformed that part of Dorchester). “It’s OK to look at costs, but you also have to look at benefits,” said Rafael Mares, vice president at the Conservation Law Foundation. So far, the administration has done a great job of lowering expectations on the project, even threatening to cancel it altogether. Happy to jack up fares on riders, they won’t go near higher taxes for others, even though everybody would benefit. So they say we can’t afford what planners had envisioned, and advocates have scaled back their demands. But diminished expectations exact their own price. We didn’t demand more than the cost-efficient glass boxes that dominate the Seaport, and now that place — which could have been the city’s showpiece — is a monument to the mundane. We didn’t demand more after the Big Dig blew out its budget, and so the tunnels are unfinished, the mosaics that were supposed to make them special nixed (art, it seems, is always dispensable). Here you go, posterity: We hope you like vanilla! Our forebears didn’t do this to us. They dreamed big, and beautiful. Even — or especially — when it came to public spaces. The new Government Center stop shows we’re capable of it. But nobody is asking for iconic when it comes to the Green Line. We’re just talking about fulfilling its promise. Surely we owe our grandchildren at least that.